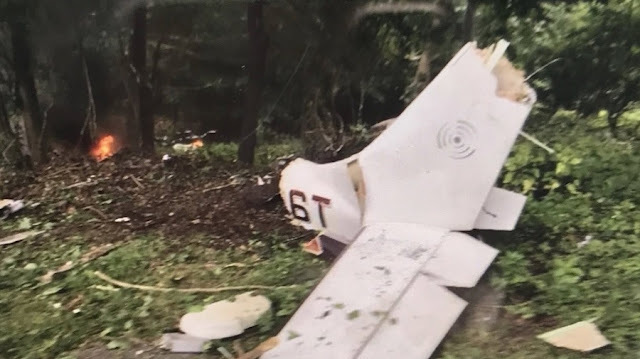 On September 15, 2018, about 1103 eastern daylight time, a Columbia Aircraft Mfg LC41-550FG, N2536T, collided with trees and terrain during an instrument approach at Woburn, Massachusetts. The private pilot and one passenger were fatally injured. The airplane was destroyed. The airplane was registered to the pilot and was operated under the provisions of Title 14 Code of Federal Regulations Part 91 as a personal flight. Day, instrument meteorological conditions prevailed, and an instrument flight rules flight plan was filed for the flight. The flight originated at Republic Airport (FRG), Farmingdale, New York at 0954 and was destined for Laurence G Hanscom Field (BED), Bedford, Massachusetts. According to preliminary data from air traffic control, the flight was handed off from Boston approach control to BED tower after being cleared for the ILS approach to runway 29. The pilot contacted BED tower and was cleared to land. As the flight crossed the final approach fix (JAYSE), the controller issued a low altitude alert to the pilot. The pilot acknowledged the call and stated, at 1101:50, that he was climbing. About 20 seconds later, the controller advised the pilot that he was drifting north of course. The pilot did not acknowledge the call. At 1102:36, the controller issued another low altitude alert and asked the pilot if he was still on the approach. The pilot responded that he was not. Radar and radio contact were lost about 1103. The airplane collided with trees and terrain on a heading of about 070° in a wooded area behind a residence. The wreckage path was about 300 ft in length. The airframe was highly fragmented. There was a postaccident fire that consumed about 20% of the wreckage. The engine separated from the firewall and the propeller separated from the engine during the impact sequence. All primary structural components and flight control surfaces were accounted for within the debris field. The pilot held a private pilot certificate with airplane single engine land and instrument ratings. Federal Aviation Administration records revealed that he purchased the airplane new in 2006. According to his pilot logbook, his total flight time was about 1,945 hours. He completed a flight review on January 15, 2018. The composite-construction, four-seat airplane was equipped with a Continental TSIO-550-C engine rated at 310 horsepower. The engine was fitted with a three-bladed Hartzell constant speed propeller. According to the airplane logbooks, an annual inspection on the airframe and engine was completed on December 14, 2017 at 1,339 hours total aircraft time. BED was located about 4.8 miles west of the accident site. The 1108 weather observation at BED included wind calm, an overcast ceiling at 600 ft, visibility 2 statute miles with mist, temperature 19°C, dew point 18°C, and an altimeter setting of 30.21 inches of mercury. 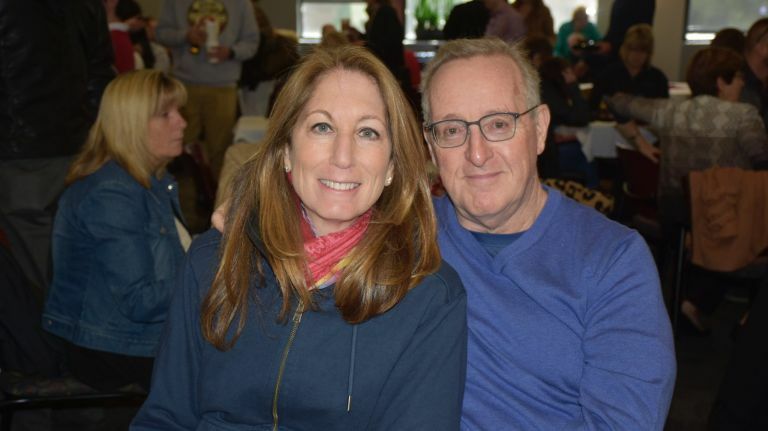 Dr. L. Michael Graver, right, the chief of adult cardiac surgery at North Shore University Hospital, and his wife, Jodi Cohen, both of Manhasset, were killed when the aircraft Graver was flying crashed behind a home in Woburn, Massachusetts, on September 16, 2018. Family and friends on Sunday remembered a Long Island surgeon and his real estate broker wife as a loving couple dedicated to their families, their careers and to each other. 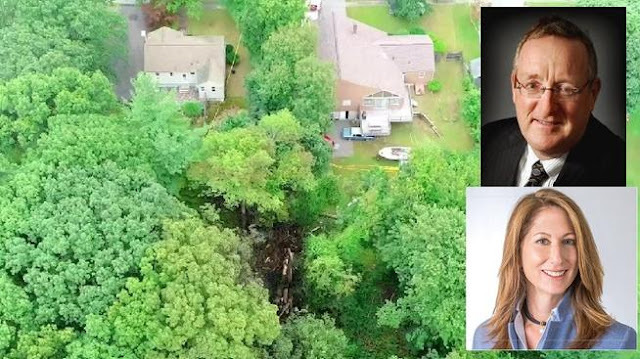 Dr. L. Michael Graver, 65, and Jodi Cohen, 55, of Manhasset, died Saturday morning when their small plane crashed behind a home in Woburn, Massachusetts, authorities said. Officials have not said what caused the accident. The National Transportation Safety Board is in the very early stages of the investigation, which will include a review of the pilot's record and the plane's maintenance, a spokesman said Sunday. Graver, the chief of adult cardiac surgery at North Shore University Hospital, was flying a 2006 Columbia Aircraft LC41 and departed with Cohen from Republic Airport in East Farmingdale about 9:30 a.m. They were scheduled to arrive around 11 a.m. at Hanscom Air Force Base in Bedford, Massachusetts, according to the FAA. The couple was headed to Massachusetts to have lunch with Graver’s son Adam, 33, an orthopedic surgeon, and his wife, of Olympia, Washington, who were attending a medical conference in Boston, friends said Sunday. Graver and Cohen were adventurous and loved travel, aviation and the outdoors, friends said. Colleagues remember the couple coming back from weekend jaunts describing the places they’d flown to, including meals on Nantucket and the famed Oshkosh air show in Wisconsin. They were “terrific together, a super couple” with many friends and a full calender of social and travel plans, said Dr. Robert Palazzo, an attending cardiac surgeon at Northwell Health. Graver was last issued a private pilot certificate in 2014, FAA records show. Friends described him as an experienced pilot who had flown for more than a decade. Flying was a passion that he shared with his son and also with Cohen. The couple married in September 2010. Graver and Cohen lived in a gated community of large homes and shaded streets, and they both excelled in their careers, where they were each remembered as successful, hardworking and talented. Cohen, a certified public accountant, worked as a real estate broker at Douglas Elliman in Manhasset. She grew up in North Woodmere, attending Lawrence High School and then Adelphi University and University of Florida, where she studied accounting, her sister Beth Kotin said Sunday. “I'm just still shocked that this happened to them,” said Kotin, 58, of Manhattan. “They were both really good people, and very close to us and my kids. So it's terrible." Colleagues described Graver as a master surgeon whom they would trust to operate on their own loved ones. Dr. Karen Kostroff, chief of breast surgery at Northwell Health and a close family friend, said Graver “fell into the rare subset of extraordinary surgeons” and had operated on thousands of patients over his four decades practicing medicine. He was recognized earlier this year as one of four cardiothoracic surgeons statewide with the lowest mortality rates. Graver was “the best of a friend, the best of a physician, the best of a father and the best of a husband,” Kostroff said, adding that he was a “brilliant person" who could talk about any subject. The couple's eighth wedding anniversary would have been on Sept. 26. A funeral will likely be held in the coming week, friends said. A husband and wife died died Saturday morning when their small plane crashed into a wooded area of Woburn, authorities are reporting. Dr. Michael Graver and his wife Jodi Cohen of New York were killed when their lightweight aircraft went down behind a home in the Minchin Drive area off of Lexington Street around 11 a.m., District Attorney Marian Ryan confirmed in a press conference Saturday afternoon. Residents congregating on Grace Road after the crash reported feeling a concussion that shook their homes. While there has been ongoing blasting in the area due to construction, this felt different, they said, like something had gone very wrong. Robert Miguel was working in the yard at his sister’s home on Grace Road when he heard the plane’s sputtering engine. In a press conference held Saturday afternoon, Woburn Mayor Scott Galvin confirmed the two deaths and added that there were no presumed survivors. There were no reported injuries on the ground. The Federal Aviation Administration identified the plane as a Columbia LC41-550FG. Federal Aviation Administration investigators were enroute Saturday afternoon to begin an investigation. A married couple died after their small, two-seater plane crashed in a wooded area in a residential neighborhood in Woburn on Saturday morning, authorities said. The two were identified as 65-year-old Dr. Michael Graver and 52-year-old Jodi Cohen, according to Middlesex District Attorney Marian Ryan. The single-engine Columbia Aircraft LC41 crashed at around 11 a.m., four miles from Laurence G. Hanscom Field in Bedford, where it was approaching. 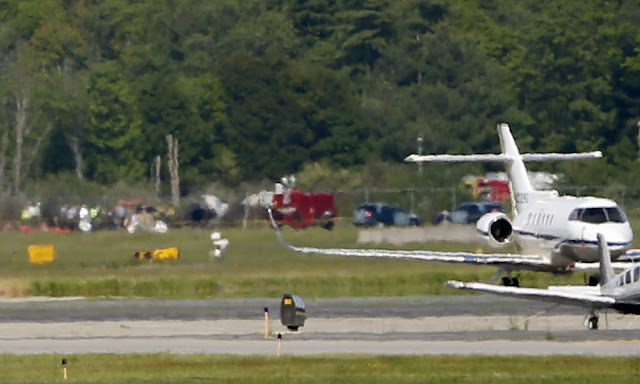 The plane had departed from Republic Airport in Farmingdale, New York, around 9:30 a.m., The Associated Press reported. Graver was a "very experienced pilot" and co-owned the 2016 plane, Ryan said. Woburn Mayor Scott Galvin said it was a miracle the plane did not hit the residential area, nor anyone on the ground. Donna Landino, who lives across the street from where the crash happened, was cleaning her house when she "heard a huge bang." She thought a car had crashed into her house. "I came out, and there was a plane in between two houses with an explosion," Landino said. "There was some fire," Landino added, which made her nervous, especially after the gas explosions and fires in the Merrimack Valley on Thursday. Woburn and State Police, as well as FAA officials and the National Transportation Safety Board, are investigating the crash. 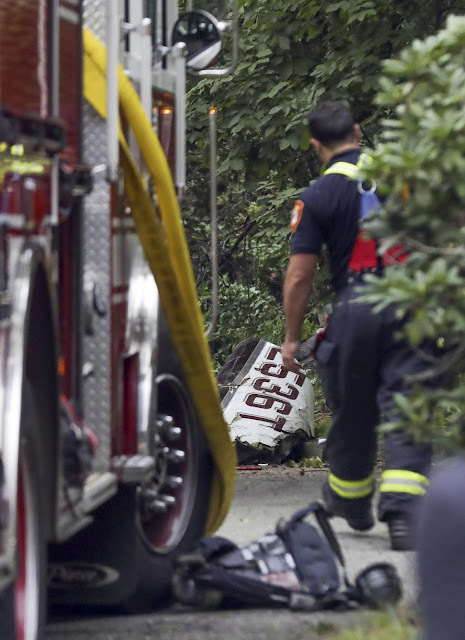 WOBURN, Massachusetts — A husband and wife died died Saturday morning when their small plane crashed behind a home in a wooded area in Woburn. First responders said there was a large fire when the first firefighters arrived at the scene. Neighbors described hearing an explosion that “sounded like the end of the world," then a large fire. The Federal Aviation Administration identified the plane as a Columbia LC41-550FG. The agency was enroute to the scene to begin the investigation. Here is the flight track on flightaware. Anyone have ATC recordings for this one? Sad to see an experienced and up to date pilot die with his wife in his capable and well-maintained aircraft he'd owned for 10 years in what would seem to be a rather routine for him daytime IFR flight. Hopefully the investigation will bring information to light that will be instructive and help avoid other tragedies.